Routes 60 and 60A are new routes being run by Target Travel Monday to Fridays. The main daytime service being the 60 which will run every 20 mins between The George Park and Ride, Marjons and Derriford Hospital (mapped Green above). In the morning and afternoon peaks they are joined by the 60A (The blue section above - the route includes the green section as well) linking in Woolwell and Belliver Way to the 60 route. This combines to give a very frequent service between Derriford and The George. 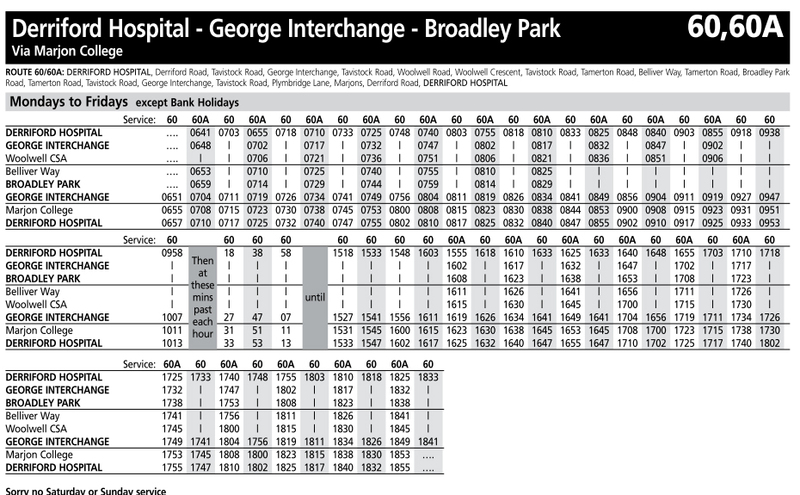 It states in the timetable that the 60 is provided as a commercial service by Target Travel. The routes replace the old X56 X57 and Taxibus 225. This does seem to be a bit of an interesting gamble by Target but it does help that Derriford Hospital staff are encouraged to park at the George Park and Ride site. I can also see it hitting First Devon and Cornwall service 7 which also provides a twenty minute service between the two locations. Target Travel leaving The George 3 minutes before First which I am sure is pure coincidence! Getting towards the end of these posts now. Later there will be one more - the new 227 service and then one further post next week looking at the other changes due to happen on the 5th along with a few comments!